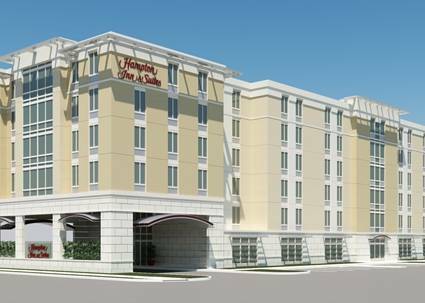 Find a home away from home at our Hampton Inn - Suites Orlando/Downtown South-Medical Center. This welcoming hotel is within walking distance to Orlando Regional Medical Center UF Health Cancer Center and Arnold Palmer Hospital for Children. Just a few blocks from the Amtrak line it*s easy to get around town from our hotel. Make your stay easy with free hot breakfast every morning or if you*re pressed for time grab one of our Hampton*s On the Run Breakfast Bags available Monday through Friday. All our rooms feature two queen or one king-sized Hampton clean and fresh bed along with a lap desk and free WiFi. Unwind with your favorite shows on the 39-inch HDTV. Book one of our 35 suites for more space a separate living area and a sleeper sofa. Take a break under the Florida sun in our heated outdoor pool. Continue your workout plan in our fitness center with a treadmill elliptical free weights and weight machines. Host an event in our expanded 1 800 sq. ft. space for up to 85 people. Utilize the LCD projector with screen conference phone and free WiFi for a successful meeting or training seminar. Plan a fun Orlando break with the friendly service and local advice from our hotel staff.